Gold was a tad lower last night, trading in choppy fashion in a range of $1287.60 - $1293.40. It rose to its $1293.40 high early during Asian hours against a dip in the US dollar (DX to 95.46). Later during Asian time and during early European hours, the yellow metal faded to its $1287.60 low where support at the $1286-88 triple bottom (1/10, 1/11, and 1/14 lows) held. Gold was pressured as global equities advanced on China announcing a package of stimulus measures to boost its economy. The NIKKEI was up 1%, the SCI gained 1.4%, European equities were up from 0.2% to 0.5%, and S&P futures were +0.5% - with firmer oil (WTI from $50.60 - $51.38) aided the rise in stocks. A rebound in the DX (95.93) also weighed on gold, which was boosted by weakness in the pound ($1.2915 - $1.2830, jitters ahead of today’s vote in Parliament) and the euro ($1.1490 - $1.1411, disappointing German growth data). However, ahead of the NY open, a miss on earnings from JPM Chase, along with some comments from CEO Dimon that a prolonged US Government shutdown will lead to 0 growth in Q1 took US equity futures lower (S&P futures to 2584), allowing gold to bounce to $1292. The rally quickly faded though, and gold slipped back to $1288-89. At 8:30 AM, weaker reports on the Empire State Manufacturing Index (3.9 vs. exp. 11.3) and PPI -0.2% vs. exp. -0.1%) sent S&P futures further down (2580), and took the US 10-year bond yield down to 2.681%. The DX slid to 95.70, and gold rallied back, taking out its overnight high to reach $1294.50. However, resistance at the $1295-98 (6 tops – 1/3, 1/4, 1/7, 1/10, 1/11, and 1/14 highs) held once again. US stocks turned higher after their open (S&P +23 to 2606), lifted by Netflix (raising prices) and gains in the Communication Services, Health Care, and IT Sectors. The 10-year yield moved up to 2.709%, and the DX rebounded to 95.88. 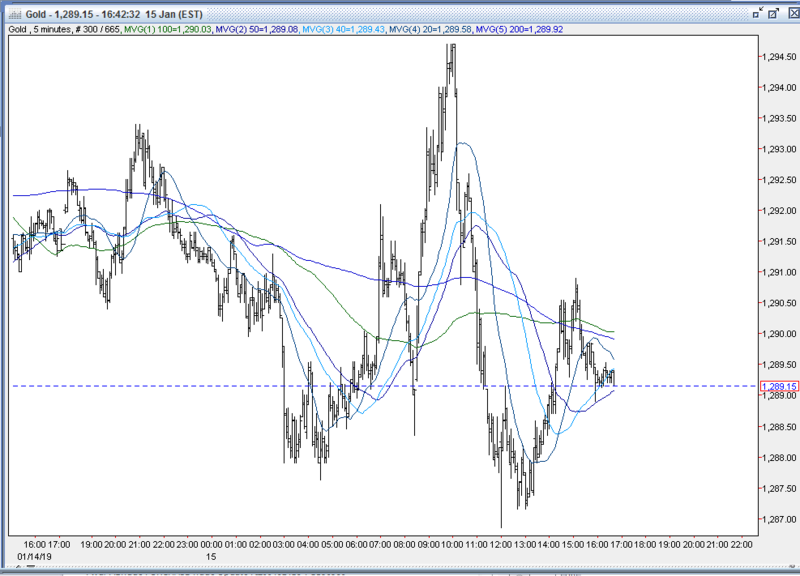 Gold retreated in response but found support around $1290.50. Shortly afterward, US stocks pared gains (S&P +10 to 2593) on comments from Senator Chuck Grassley saying US Trade Rep Lighthizer saw little progress on key issues in last week’s US-China trade talks. The 10-year yield continued to creep higher, however, and touched 2.713%. The DX was caught in the cross-currents and dipped slightly to 95.82, and gold edged higher to $1292.50. Into mid-day, a tumble in sterling ($1.26.94, market positioning for a big majority Brexit vote defeat, stops under $1.28) and the euro (1.1383, dovish comments from Draghi) drove the DX past 96 and 96.02 (100-day moving average) to reach 96.25 (1-week high). The dollar was also helped by a move higher in US stocks (S&P +30 to 2613), and the 10-year yield moving up to 2.718%. 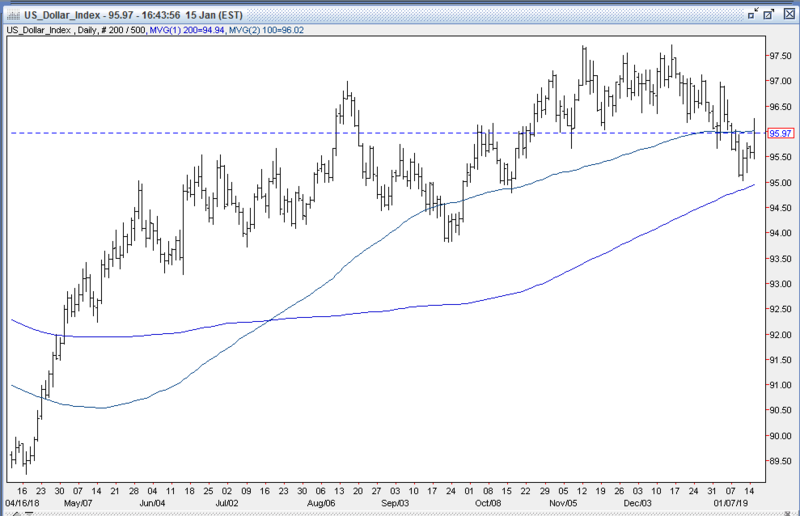 Gold sold off to $1286.85, where support at the triple bottom held once again. The Brexit vote was a landslide – 432 – 202 against May’s Brexit deal. While the pound initially collapsed to $1.2670, it sprang back up to $1.2889, as the probability of a hard Brexit were minimized. The euro rebounded to $1.1417, and the DX sank to 95.91. 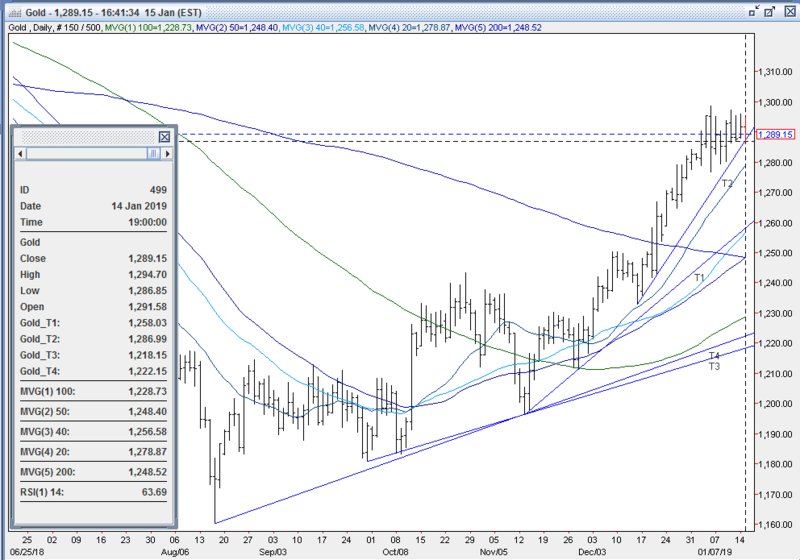 Gold recovered and traded up to $1290.75. Later in the afternoon, US stocks – which had dipped on the Brexit vote – rallied back (S&P finished +27 to 2610), helped by an advance in crude (WTI to $52.27), and some dovish comments from the usually hawkish Fed’s George (Fed should pause until it assesses conditions). The US 10-year yield – which had declined to 2.697% on the vote – recovered to 2.717%. 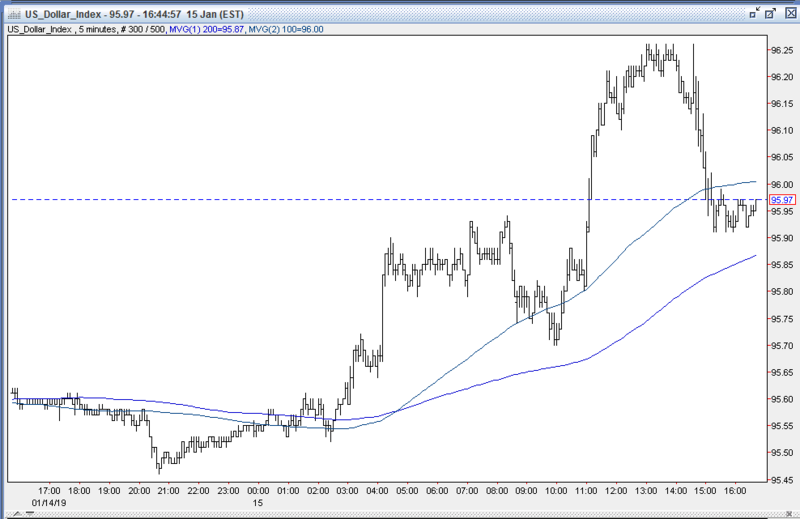 The DX hovered around 95.95, and gold slid to $1289 for a $2 loss. Open interest was up 15k contracts, showing mostly new longs (but a fair amount of new shorts) from yesterday’s advance. Volume was higher with 277k contracts trading. Bulls were once again disappointed that gold couldn’t crack the stiff resistance at $1295-98 this morning especially when equities tumbled off of the JPM Chase earnings and as the DX fell off weak the PPI and Empire State Index. However, other bulls were pleased with gold’s ability to still hold support in the high $1280’s – despite the greenback’s ensuing strength and another strong gain in US stocks. Bulls feel that the trend is their friend, and expect the yellow metal’s strong rally over the past two months to carry further. Bulls expect to breach tough initial resistance at $1295-98 (7 tops – 1/3, 1/4, 1/7, 1/10, 1/11, 1/14, and 1/15 highs), where they expect to trip some significant short covering that they feel should open up a test of next resistance levels at $1303 (6/15/18 high), $1309 (6/14/18 high), and $1315 (5/15 high). Bears feel that gold’s rally has been overdone (up 8.5% since 11/13 $1196 low), and its overbought indicator (14-day RSI) - though off its 77 high from last week remains elevated at 64. They feel the 20% correction in equities – much of which occurred during very illiquid holiday trading – was also overdone, and expect the rebound seen over the past two weeks to continue. Bears feel that the plunge in the US dollar seen since 12/14 (97.71 – 95.03, 2.74%) has also overshot, and look for a significant rebound in the greenback. Bears will look for a breach of support at $1286-88 (quadruple bottom, 1/10, 1/11, 1/14, and 1/15 lows, uptrend line from 12/14 $1233 low) followed by the double bottom at $1279-80 (1/8 and 1/9 lows) to begin a more significant correction. They expect a move to at least $1247 – the 50% retracement of its up move from the 11/13 $1196 low. All markets will continue to focus on geopolitical events (especially Brexit developments), developments with the Trump Administration (especially on US-China trade, potential legal issues), oil prices, Q4 corporate earnings, and will turn to reports tomorrow on Japan’s Machine Orders, Tertiary Industry Index, and Corporate Goods Price Index, China’s New Home Prices, German CPI, UK CPI and PPI, US MBA Mortgage Applications, Retail Sales, Import Prices, Export Prices, Business Inventories, NAHB Housing Market Index, Oil Inventories, the Fed’s Beige Book, and comments from the Fed’s Kashkari for near term direction. However, the release of many US reports are subject to the ongoing government shutdown.